Online quizzes are great time wasters but if you find quality quizzes, they can be really informative and educational. For photography beginners and enthusiasts, they can test their knowledge in the field using these online ready-made questions. They just have to know where to look and what to look for. Here are some recommended websites for you to start with. This quiz is aimed at matching singles by way of interests. While it’s not the most obvious place to look for a quiz about photography, it is a great way to measure one’s knowledge in photography. This online photography quiz was created by one of the administrators of the dating site and it focuses on the history and the technological advances in the field of photography. 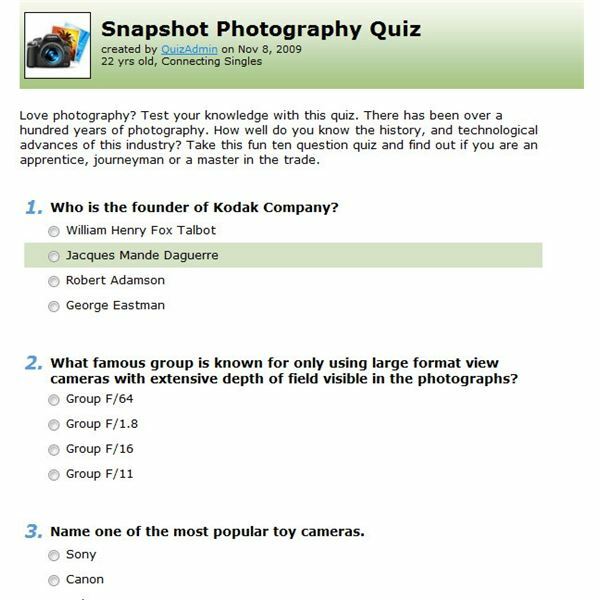 The quiz has 10 questions and is ideal for people who know a lot about the technology and the science behind photography. It feels a little out of place in a dating site especially among a bunch of personality quizzes, but this one is a keeper. GeoffLawrence.com is a website for photography tips and tutorials. In this collection of valuable information about the field, you can find a fun and highly informative quiz. You can set the number of questions for the quiz to be five, ten or 20, and you can set a time limit from one to five minutes. This makes it versatile enough for both beginners and experienced photographers. If you do not want to be pressured while answering each question, and take it slow and easy, you can set the time limit to No Time Limit. Adding to the fun is the user’s ability to get hints when the question proves to be too difficult. The quiz lets the user know whether they got the question right or wrong. In the end, it tells you your score and your Photography Nerd, or PN, rating. This rating adds a level of fun to the quiz and it also acts as motivation for the user to explore the rest of the site to gain more knowledge and do better with the quiz next time. This single page quiz is composed of ten multiple choice and True or False questions. It is a pretty straightforward quiz, and involves questions that beginners will find extremely hard to answer. Users are given three minutes to answer all ten questions, and this time limit adds to the pressure of getting the answers right. You will notice in the instructions window that this quiz was part of a contest. You can simply ignore that. The quiz is still a formidable challenge even without a prize on the line. 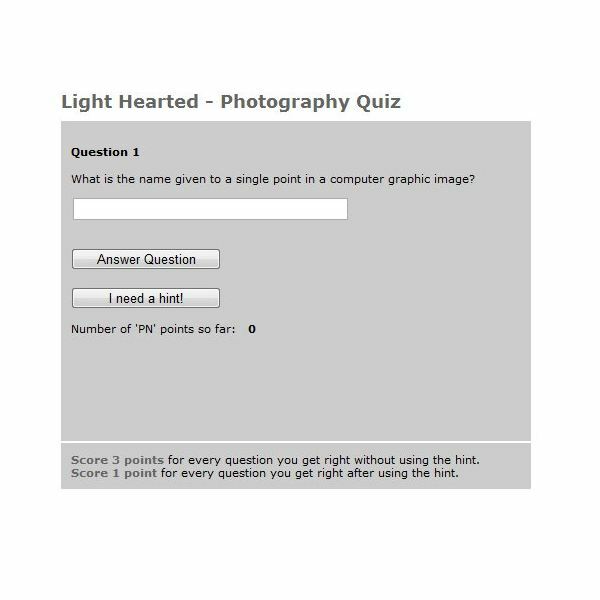 If you are looking for a simple way to challenge your knowledge in photography – especially its more technical side – give this ten questions quiz a shot. This quiz tackles advanced photography concepts. 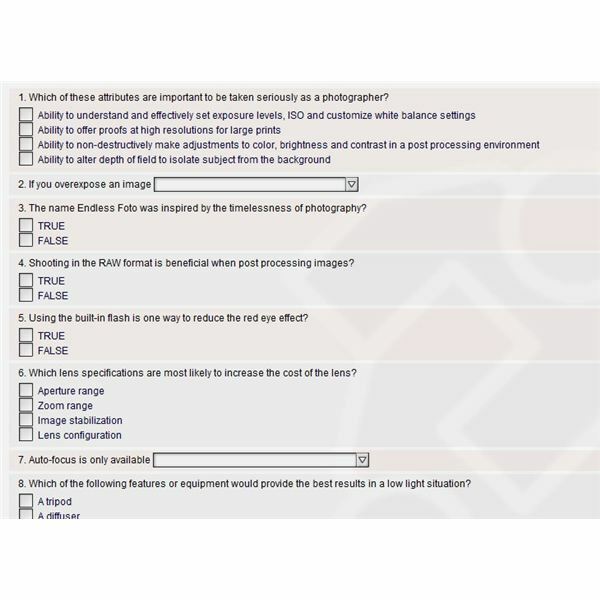 It has 25 multiple choice questions, including one that requires the quiz taker to visually determine the light source of an image relative to the camera. After the final results are shown, users can then interpret the results via the information located at the bottom of the quiz page. There is also a basic test available if you want an easier set of questions. This quiz is designed for intermediate and advanced users, but there is also a basic test available if you are a beginner or if you simply want an easier set of questions. The site is does not look like much with its basic layout and style, but that should not push you away from this challenging test of photography knowledge. The Afterimage gallery photography quiz leans more toward the history and culture of photography. There are no technical questions here. It is more like a handy guide to photography trivia because all the answers are provided on the page or in the glossary section of the website. A touch of fun is added with cute sounds playing whenever you pick an answer. Since it does not contain scientific and technical information about photography, it is ideal for people who are just getting acquainted with the field. 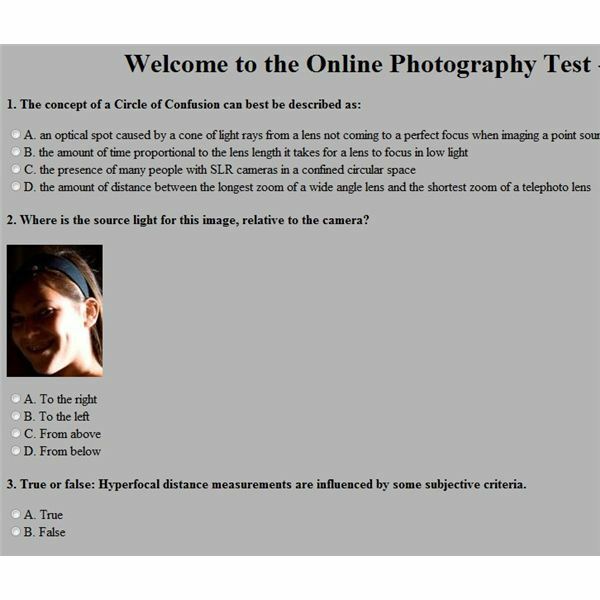 Finding an online photography quiz can be done quickly using quiz maker sites, but there are other types of websites out there that offer pages featuring a quiz about photography. You will find that these more target quizzes offer specific information and a deeper understanding of the kind of questions that can measure one’s knowledge about photography. Do you know of other sites offering photography quizzes? If so, be sure to visit our comments section below.